This post in the recent series on December 2017 research and travel in Guangxi, China was written by Carrie Hertz, who also provided the photographs. 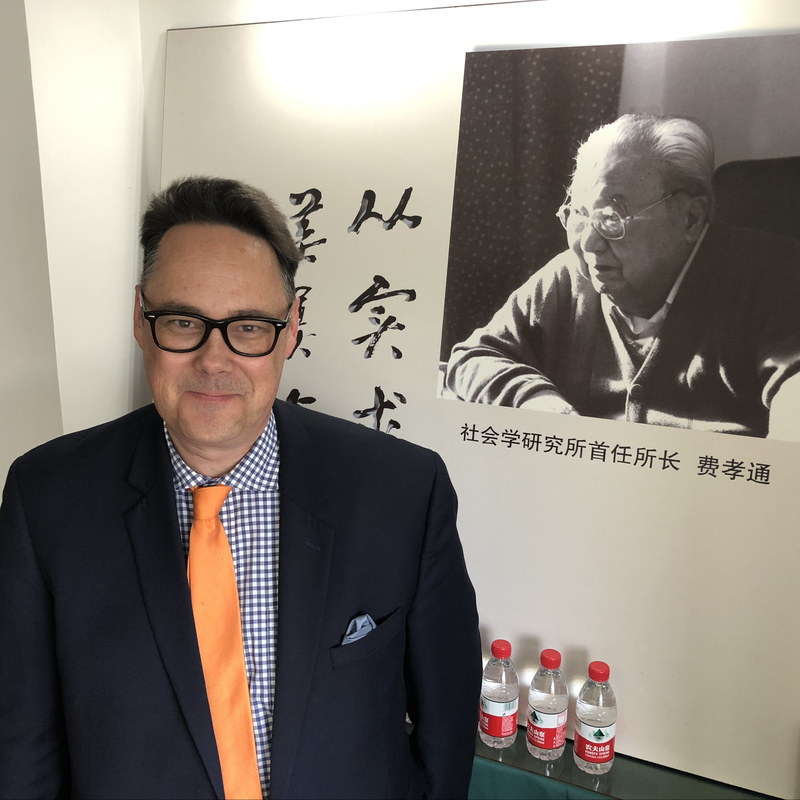 In this post, I complement Jason’s series of field reports (1, 2, 3, 4, 5, 6, 7, 8, 9) on our December 2017 trip to China with some highlights from the research team focused on Baiku (White Trouser) Yao textiles. The textiles most visible in daily life are traditional baby carriers and women’s dress. December 15, 2017. Textile making traditions are extraordinarily strong in Huaili village. In most households you can find a floor loom, an indigo dye pot, and a cache of tiny silkworm eggs. Because of the damp climate, most families hang their laundry out to dry. Strung out like banners across rooftops, balconies, pathways, and side yards, the clotheslines offer a visual inventory of typical wardrobes. Children play under skirts hung up to dry. December 15, 2017. Daily dress combines traditionally made and mass-produced garments. Most women have several sets of indigo-dyed skirts, aprons, jackets, and tunics in regular rotation, the finest serving as festival dress when new, and as daily wear when faded. With age, the natural red dyes of embroidered skirt hems bleed, creating a beautiful ombre effect, and the appliqued silk felt disintegrates, taking on a feathery appearance. A beautifully aged skirt hung out to dry. December 17, 2017. Each garment represents countless hours of skilled labor, spread out throughout the year. Winter, while fields lie untended, is a busy time for textile production. Throughout the village, small groups of women huddle around fires on their front stoops, busy with embroidery or winding spools of cotton. Lu Xiao Mei works on her embroidery while visiting with Li Xiu Ying and Wang Lian Mei holding her baby. December 15, 2017. Winter is also a good time for warping looms. Women help each other, taking over the village courtyard. It takes the better part of a day to set up warp poles and wind the approximately 80 meters of thread in a spiral pattern around them. Setting the warp poles. December 17, 2017. Winding the warp. December 17, 2017. Sleying the reed. December 17, 2017. Beaming the warp. December 17, 2017. The tree sap used to draw intricate resist patterns on clothing is harvested in winter. The bark is scarred and glistening where people have gouged it with their knife blades. We had the great fortune to spend two days with a recognized master textile artist, He Jinxiu. She is considered the most skilled and knowledgeable needleworker in Huaili village and teaches embroidery and resist dyeing to all of the girls attending the local primary school. At her home, she brought out stacks of textiles that she was currently working on as part of a yearly cycle of production. Together we inventoried these materials, along with the tools, techniques, and terminology important to their creation. We diagrammed garment patterns. We filled notebooks with the local names for various motifs and their significance. Liang Xiaoyan films He Jinxiu drawing resist patterns in sap on a cloth she will later indigo-dye and sew into a skirt. December 14, 2017. Detail of a newly-made skirt. The hem is embroidered in red silk and appliqued with a wide band of silk felt. December 15, 2017. This beautiful tunic is made with three layers, each elaborately embroidered and resist-dyed, though only the top layer can be seen. It is only worn for spring festivals and funerals. December 15, 2017. The home production of textiles is supplemented with supplies and finished goods purchased in the Lihu Town market. Alongside the many stalls stuffed with factory clothes and accessories, vendors sell silk embroidery thread, stylus for batik, and bolts of undecorated, hand woven cloth. A large area is devoted to selling indigo. One half kilogram costs about 6 RMB. In addition to being an important venue for textile sellers and makers, market days are for dressing up, for looking and being seen. Bolts of hand woven cotton cloth for sale. December 16, 2017. Indigo dye pots at the Lihu Town market. December 16, 2017. A woman tests the different dye pots by comparing the colors on her hand and tasting for bitterness. If the dye is bitter, it is too acidic and will not dye well. December 16, 2017. We also had opportunity to interview Li Xiu Ying, the primary textile producer in her family. For most of her life, her mother made her clothes, but now she makes clothes for her mother, using the skills her mother imparted. Li Xiu Ying wears a handmade needle case hanging from her belt. Her nail beds are ringed with blue from indigo dye. December 15, 2017. With Mrs. Li, the textile team examined a traditional burial cloth, part of the ecomuseum’s permanent collection. Every household hopes to always have a few of these on hand. When villagers die, the cloth is laid over the body and a series of smaller cloths, thirteen layers for men and fourteen for women, cover the face. Li Xiu Ying with Ecomuseum staff member Wang Caijin. December 15, 2017. Fan Miaomiao and Li Xiu Ying hold up a traditional burial cloth. December 15, 2017. A woman’s burial face cloth made by He Jinxiu is now in the collections of the Museum of International Folk Art. He Jinxiu holding up a woman’s burial face cloth that she made, now in the collections of the Museum of International Folk Art. December 17, 2017. The textile research team feels incredibly grateful to those who shared their time and knowledge with us. These brief highlights merely touch upon what we learned and experienced during our visit. Carrie Hertz is Curator of Textiles and Dress at the Museum of International Folk Art and a participant in the China-US Folklore and Intangible Cultural Heritage Project.